Club Brugge left the Luminus Arena empty-handed following a 3-1 defeat. Hans Vanaken cancelled out Trossard's opening goal, but shortly after the break Malinovskyi converted a controversial penalty to give Genk the lead again. Ten minutes before the end Samatta decided the game with a header. Club are again four points behind the league leaders. Matchday four in the Play-Offs and Ivan Leko picked the same eleven players to face Genk. The game started lively with two eager sides, but both had trouble creating a chance in the opening minutes. The first chance, after twelve minutes, immediately resulted in a goal, when Denswil unwillingly played the ball into the feet of Leandro Trossard who slammed it past Horvath. Club tried to equalize right away, but Vanaken's aim was off on a corner from Vormer. The hosts were still the more dangerous side: both Samatta and Trossard were piloted through the defence, but they found Horvath on their way. For Club Brugge, Mata's shot trickled wide. The blue and black were nowhere near their level of the previous games and were lucky not to concede a second goal. Malinovskyi's effort was blocked, Horvath had to be quick to clear Denswil's back pass and denied Trossard. Ten minutes before the half-time break, Club managed to equalize from the penalty spot. Uronen brought down Vormer inside the box, Hans Vanaken fired in. And Club almost took the lead in the closing minutes of the first half, but Diatta just couldn't tap in Vormer's cross. On the other side of the pitch Horvath had to deny Ito and Dewaest's header on a free-kick was disallowed as he had strayed offside. Ten minutes into the second half the home side took the lead again when the ball unintentionally hit Brandon Mechele's arm and referee Boucaut pointed to the spot after a VAR review. Malinovskyi behind the ball and he slotted home. Amrabat had replaced Rits at half-time, and halfway the second half Leko brought on Openda and Danjuma to try and get back into the game. It resulted in a few chances for Club: Schrijvers saw his shot blocked, Openda's cross was headed clear before Dennis could blast it in and Danjuma fired wide after a great move. On the other side of the pitch Samatta couldn't convert Ito's cross while an effort from the Japanese went wide. 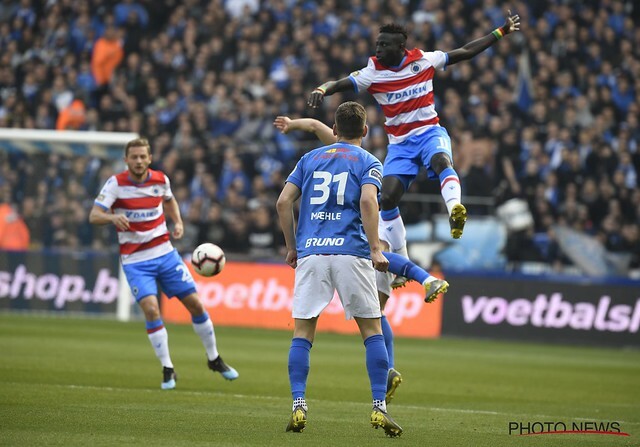 The blue and black had to take a lot of risks in the closing minutes, but instead of equalizing Genk scored a third goal. Ito floated the ball across the goal area and Samatta headed in via the underside of the bar: 3-1. Club tried everything to make the game interesting again, but couldn't find the back of the net anymore. Due to this defeat, Club are again four points behind Racing Genk who lead the pack. With six more games to come, everything is still possible. Club Brugge: Ethan Horvath – Clinton Mata, Brandon Mechele, Stefano Denswil – Emmanuel Dennis (69’ Arnaut Danjuma), Ruud Vormer, Mats Rits (46’ Sofyan Amrabat), Hans Vanaken, Krépin Diatta – Siebe Schrijvers (65’ Loïs Openda), Wesley Moraes. Bench: Karlo Letica, Luan Peres, Benoît Poulain, Jelle Vossen, Dion Cools en Saulo Decarli. Coach: Ivan Leko. Yellow cards: Dennis, Rits, Samatta, Mata. Goals: 13’ Trossard (1-0), 35’ Vanaken (penalty, 1-1), 54’ Malinovskyi (penalty, 2-1), 80’ Samatta (3-1).